In June 2017, the project partners will meet in Losada for the final project meeting. The International Poetry Festival in Vilnius will take place on the 12-13th of May 2017. The International Poetry Festival in Turku will take place on the 7-8th of April 2017. The International Poetry Festival in Krakow is planned to be held on the 18-19th of March 2017. Click here to download the Agenda for the Festival. SIH director D.Malinauskiene will hold a press conference to announce the opening of the ePublisher poetry projections on the LED display of the National Gallery of Art. The conference will take place on Tuesday, 15th November at 11.00 AM in the National Gallery of Art. On October 7 SIH will organise an excursion to Kaunas for the most active ePublisher poets and translators. In September 2016 the project partnersmetin Turku to review the progress of the project and to discuss the upcoming poetry festivals. On June 11-12 Multikultura will organise an excursion to Krakow for all new ePublisher poets from all over Poland. The excursion will be organised on the occassion of the annual Krakow Poetry Night. On Saturday, 11th June 2016, Multikultura will organise the 2nd Poetry Reading event in Krakow. During this event the newly published ePublisher poetry will be read and discussed. 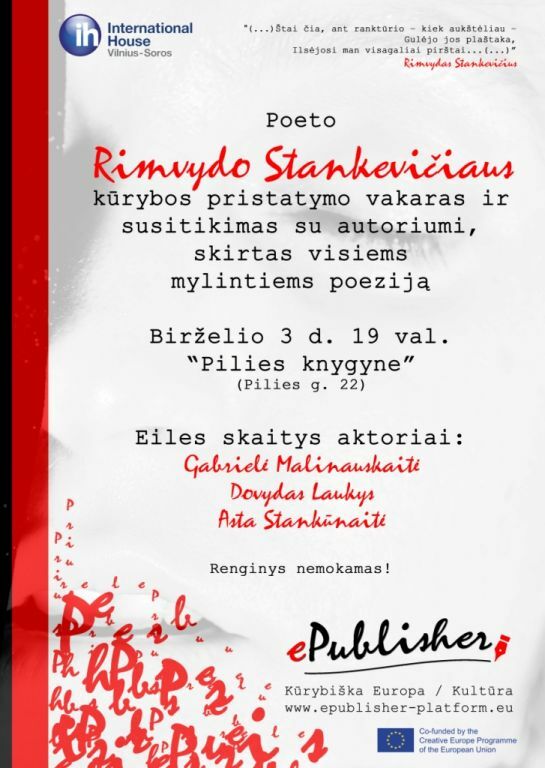 On Friday, 3rd June, at Coffee Inn situated in the heart of Vilnius’ old town SIH will hold a meeting with a famous contemporary poet Rimvydas Stankevičius. During the event, his poems will be read by actors Gabrielė Malinauskaitė, Dovydas Laukys, Asta Stankūnaitė. Birželio 3 d.,19 val. visus, mylinčius poeziją, kviečiame į poeto Rimvydo Stankevičiaus kūrybos vakarą ir susitikimą su autoriumi. Renginys vyks Coffee Inn kavinėje, įsikūrusioje Vilniaus senamiesčio širdyje, Pilies g. 22. R.Stankevičiaus eiles skaitys aktoriai Gabrielė Malinauskaitė, Dovydas Laukys, Asta Stankūnaitė.